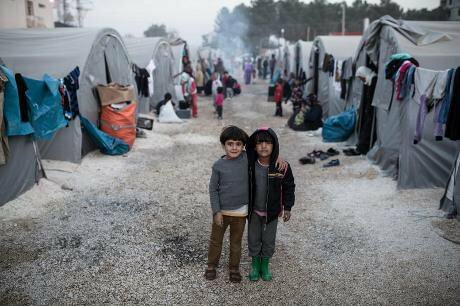 These two refugees from Kobane, in a camp in Suruç in southern Turkey, are among what the authorities estimate are 280,000 Syrian Kurds who have sought sanctuary across the border. Demotix / Konstantinos Tsakalidis. All rights reserved. Until a year ago, it seemed as if some sort of reconciliation between the Turkish state and its Kurds would be feasible. With the launch of the ‘Kurdish opening’ in 2009, the leadership in Ankara was re-engaging the Kurdish population after decades of estrangement. The announcement of the ‘peace dialogue’ between the government and Abdullah Öcalan, the imprisoned leader of the Kurdistan People’s Party (PKK), as well as the ‘reform package’ introduced by the then prime minister, Recep Tayyip Erdoğan, confirmed in the eyes of many the executive’s genuine interest in reconnecting with its Kurdish community. Since the rise of Islamic State (IS) in Syria and Iraq in the summer of 2014, however, optimism has been in shorter supply. To be sure, the peace process is still moving along, albeit at a much slower pace than desired. Yet Erdoğan’s reluctance to come on board the military coalition against IS at Kobane, Operation Suleiman Shah (see below) and a series of domestic incidents since January 2015 have raised suspicions over whether Ankara is still intent on pushing the negotiations forward. Indeed Erdoğan may have given up on co-opting Kurdish aspirations, as the leadership appears to have set itself on a collision course with the Kurdish constituency. Is there a connection between its foreign policy towards Syria and its domestic agenda vis-à-vis the Kurds? Did Erdoğan have a preconceived vision of a final settlement with the Kurdish community—and, now that its likelihood looks bleak, will past progress fall by the wayside? Since late 2014, the Syrian conflict, in as far as it touches on these issues, has remained in a strange state of inertia. Some small-scale actions have chipped away at the army of the Syrian leader, Bashar al-Assad, and the Kurdish forces of the Democratic Union Party (PYD). But none—even the Kurdish victory at Kobane earlier this year—has wrought a decisive shift in the region. Operation Suleiman Shah seemed like it might. In February, roughly a month after Kobane’s liberation by Kurdish forces, President Erdoğan deployed Turkish troops in northern Syria to rescue the tomb of Suleiman Shah, the progenitor of the Ottoman dynasty, from an attack by IS militants. Some saw in this a harbinger of a neo-Ottomanist revival—Erdoğan has been the object of such an accusation more than a few times. Yet, there were forces of greater weight behind Turkey’s action. The leadership presented the operation as tantamount to national self-defense, although there is no consensus on the legal status of the piece of land on which the tomb is located. From the IS perspective, the site belonged to Iraq and therefore the presence of Turkish soldiers guarding the shah’s remains was illegal. For Erdoğan, by contrast, seizure of this territory would be equivalent to violation of Turkish sovereignty and would meet strong retribution. Operation Suleiman Shah was then planned according to military logic: when Erdoğan’s forewarning fell on deaf ears, Turkey mobilised in retaliation—essentially, as the president would have wanted, in defense of the nation’s territorial integrity. For a brief moment, and in the eyes of his electorate, he shone forth as defender of the realm and protector of national unity. Yet certain details floated to the surface in March which complicated matters—namely recordings of a secret meeting between the military and the leadership in Ankara. The discussion revolved around plausible pretexts to justify a strike in Syria and, intriguingly, one suggestion was to put forward the ‘safety of the tomb of Suleiman Shah’ as a trigger for armed reaction. Instead of focusing on the content of the leak, the leadership framed it as an ‘atrocious breach of security’ by the sympathisers of Fethullah Gülen, long accused by Erdoğan of purportedly trying to weaken the state from within. The crucial question is: why was the Turkish leadership searching for an excuse to enter northern Syria? Careful analysis suggests that the main target was not IS but the Turkish and Syrian Kurds. Far from being a small-scale action, it aimed at reconfiguring the political scene in a manner more palatable to Erdoğan. The new site selected for the tomb is only 180 metres from the frontier and sits in the middle of the territory controlled by Syria’s PYD. It constitutes a chunk of Turkish land in Syria’s de facto Kurdish region, ringed by armed Turkish conscripts. Also, the tomb is not the only ‘foreign’ element in Kurdish territory. According to the Syrian Observatory of Human Rights, forces affiliated with IS still remain in the surrounding areas. For instance, there are many pockets of IS militants holding out in northern and eastern Aleppo, which precludes any linkages between the Kurdish cantons of Afrin and Kobane. Further east from Kobane, en route to the Kurdish stronghold of Jazeera, one also stumbles on strips of land under the grip of IS, especially along the border with Turkey and in southern Raqqa. These scattered clusters already threaten to overturn the recent victory at Kobane. More importantly for the moment, they empty it of any logistical significance in terms of the PYD’s agenda for territorial autonomy. Given Turkey’s antagonism towards the PYD, the tomb is likely to serve as another mechanism to prevent the consolidation of Kurdish-controlled territories into a coherent whole. The PYD constitutes a particular source of vexation for Turkey, since it is virtually dominated by the PKK and is believed to be strengthening the latter’s demand for autonomy. In this sense, the operation was driven by the same logic that guided Erdoğan’s policy of non-intervention towards Kobane last November: obstructing the emergence of an autonomous Kurdish entity across the border from Turkey and therefore enfeebling the bargaining power of Turkey’s Kurds vis-à-vis Ankara. Accordingly, the aim here was to curtail the PYD’s room for manoeuvre, allow its units to be weakened through flare-ups with the fundamentalists and ultimately hollow out its connection with the PKK. Turkey is embroiled in a conflict with Assad which shows no sign of ending. Erdoğan continues to claim that Assad’s sheer brutality is the root cause of extremism and that, for IS to be extinguished, he must be toppled from power. What Erdoğan does not mention is that Assad had ensured co-operation in Turkey’s fight against the PKK. Naturally, this line of support dissolved in 2011. It was also Assad’s strategic withdrawal from northern Syria in 2012 that allowed the PYD to establish itself along the border with Turkey. Not only did this deprive Turkey of an ally against the PKK, but stoking Assad’s wrath also transformed the PKK into a more formidable enemy. As the struggle over Kobane demonstrated, the PYD is not likely to be defeated by IS any time soon. Even if it were, having IS at Turkey’s doorstep would unleash another series of complications. The most ‘realistic’ way forward is then to install in Damascus a friendlier regime, which would recentralise power and clamp down on the PYD’s fledgling autonomy, thus depriving the PKK and the Turkish Kurds of one of their most salient sources of strength. To be sure, the Syrian conflict is at a stalemate and Assad is nowhere near being defeated. Nevertheless, there have been some developments since January which furnish Erdoğan with an unconventional opportunity to see a change unfurl. One of them is the Saudi-Turkish coalition. Erdoğan initiated high-level talks with Saudi Arabia in April to discuss a military partnership to oust Assad. The relationship between Riyadh and Ankara is not always amiable but there are some elements in place that could easily concretise the ties. King Salman, the new head of the House of Saud, does not subscribe to his predecessor’s antagonistic view of the Muslim Brotherhood and is therefore more prone to accepting Erdoğan’s vision for a post-Assad Syria. Ankara and Riyadh will also have been brought together by their concerns over Iran’s regional ambitions. This partnership comes at a time when Ankara’s Syria policy is starkly at odds with that of the EU and the US. In January, the US secretary of state, John Kerry, announced that the State Department was shifting its stance towards unseating Assad. The French foreign minister, Laurent Fabius, also heralded a new EU policy aimed at keeping intact the political fabric in Damascus. Their reasoning is of course not miscalculated: for an easier transition to the post-IS era, an element of continuity is needed. Simply put, the EU and the US wish to avoid a repetition of what emerged in Iraq and Libya after the sudden collapse of leadership—failed states which show no signs of recovering. Assad’s removal could engender a similar situation. Without an alternative to fill the vacuum, Syria could fall into an abyss of sectarian violence. In turn, this could allow the extremists to sweep into Damascus. It is also easy to understand why this decision is vexing for Turkey: it relegates Assad’s removal to a secondary concern. The paradox, however, is that Turkey signed an agreement with the US roughly a month after this shift, launching a programme to train and equip for three years around 5,000 members of the ‘moderate Syrian opposition’ against al-Baghdadi’s so-called caliphate. From Turkey’s vantage point, these two agreements serve a common purpose: they strengthen Ankara’s hand in Syria. It is telling that Erdoğan mentioned his openness towards deploying ground troops in northern Syria to establish ‘safe zones’ along the border, if the US showed a clear commitment to removing Assad from power. Indeed, this would constitute the ideal scenario for Erdoğan, as the safe zone, although meant to be a neutral space, would put in place another ‘Turkish stronghold’ in Kurdish territory. Once stationed within the PYD-controlled lands, it will be easier to limit the PYD’s sphere of action and cripple its connection to the PKK. The US is not however likely to be forthcoming towards toppling the Syrian president. This is where the Saudi connection becomes crucial. Granted, the military effort by Ankara and Riyadh might eventually taper off in the absence of US support. But there is a host of ways for the partnership to further its agenda. For instance, Turkey will be in a position to monitor the training of troops serving the international coalition and to co-determine the way they are to be deployed. One is tempted to think that Turkey might co-opt a proportion of these soldiers and instruct them to chip away at pro-Assad forces, though this would be a blatant violation of the agreement and might cause it to lapse prematurely. Although Turkey is not likely to press the soldiers to go off on a tangent and fix their focus upon Assad, it could still influence their actions through more transparent channels of coercion, such as funding and arms supply. Furthermore, factions sympathetic to Turkey could clear the way for anti-Assad rebels to move in new directions. More significantly, they could prevent the break-up of the anti-Assad opposition and thus establish a more stalwart front against the Syrian leader. Should this finally result in an Ankara-friendly regime in Damascus, this would spell the end of the PYD and forge a riskier operating field for the PKK. Erdoğan’s image as an advocate of Kurdish reconciliation took a severe beating after his reluctance to get involved at Kobane and to a lesser extent following Operation Suleiman Shah—albeit the motive for the latter remains shrouded in mystery for most. The first months of 2015 have witnessed the almost complete dissolution of any willingness to incorporate the Kurds into Turkey’s political system. The first sign came after Öcalan’s message on 21 March, when he called upon the PKK to take the necessary measures to implement the ‘ten-point framework for peace’ drafted by the prime minister, Ahmet Davutoğlu, and the leader of the Kurdish People’s Democratic Party (HDP), Selahattin Demirtaş, in February. Erdoğan reacted a couple of days later, repudiating the framework and warning the politicians to be wary of any concessions to the Kurds. Less than a month later, another incident hampered the peace dialogue: on 11 April, the Turkish military clashed with PKK factions in Ağrı, a Kurdish-majority city near the Iraq border. This followed another skirmish between the same actors in late March, effectively violating the ceasefire which had persisted since March 2013. The military’s argument was that PKK militants were planning to attend a festival organised by the HDP, where they would supposedly launch armed demonstrations and press those in attendance to vote for the party in the 7 June elections. Demirtaş criticised the incident as a ‘staged operation’ to label the HDP as a threat to national stability, which merely showed the AKP was panicking in the face of unfavourable public opinion. The episode prompted heated remarks from the president, who said the PKK’s plans demonstrated the insincerity of the Kurds towards reconciliation. Since then, pro-AKP factions have accused the HDP several times of campaigning with guns in their hands. The negotiations with the Kurdish community have subsequently been effectively paused. Why then did Erdoğan change tack? He faces a tactical dilemma. In light of the HDP’s rise in popularity, Erdoğan has realised that overcoming the inertia in peace talks will not generate the political capital that could be cashed as votes on 7 June. This also means that granting concessions to the Kurds will no longer help him obtain a super-majority of 330 seats in the parliament next month. That is the number the AKP will need to be able to amend the constitution, transforming Turkey’s parliamentary democracy into an executive presidency. Turning up the anti-Kurdish tone suggests that Erdoğan may be trying to gain the support of Turkey’s nationalists and that if the reconciliation process will not translate into backing for his presidency, it can be discarded. One wonders what Erdoğan had in mind when he launched the peace process in 2009. Much will remain unknown until we can dig deeper beneath his co-operation with Assad against the PKK. Analysing what transpired between 2011 and the emergence of IS in 2014, however, raises a few red flags. By September last, the provisions in the ‘reform package’ had only been met halfway, which already pointed to some reticence in the leadership. Erdoğan was possibly planning on throwing crumbs of reform at the Kurds and holding the ceasefire until the 2015 elections, and therefore continue being feted as the president who solved Turkey’s Kurdish problem. The battle for Kobane furnished Erdoğan with an opportunity to push ahead with the peace negotiations with an unconventional thought in mind: wait until the Kurds have been weakened through protracted fighting and accommodate them at the negotiating table only when Ankara is in a position to dictate the terms. But with the Kurdish victory at Kobane, this policy foundered. Then came Operation Suleiman Shah. The location of the tomb allows Turkey some leverage over the PYD and the PKK; however, the enhanced logistical support of the ‘western’ coalition against IS is expected to shift the balance in favour of the Kurdish units. Despite the prospect of an Ankara-Riyadh partnership in Syria, the fate of Assad, and therefore of the Kurds in the region, will long remain uncertain. As the situation currently stands, if PKK officials do negotiate with the Turkish leadership, it will not be from a position of desperation. Öcalan has even refused to disarm until the ten-point framework, which Erdoğan clearly dislikes, is implemented. Meanwhile, the HDP’s success risks engendering a slimmer majority for the AKP in the legislature, since Demirtaş has already been vocal about how he would not satisfy Erdoğan’s constitutional ambitions. It now seems that Erdoğan’s Syria policy has been connected to the question of Kurdish autonomy and that the peace process has been a cosmetic addition to Erdoğan’s political agenda. When set in motion, however, it built momentum. The problem now is that the Kurdish community has been emboldened beyond the wishes of the policy elite and geopolitical circumstances are not conducive to weakening the Kurds’ hands vis-à-vis Ankara. The rise of the HDP has also drained away any value from the ‘political chip’ Erdoğan thought he had created with an attempt at reconciliation. Yet addressing these heightened expectations offers the only way out of this conundrum—regardless of whether it will further anyone else’s agenda.